Once again, we have my (mildly) edited notes for this year’s Oregon Brewer’s Fest! Let’s get moving. Ex Novo: Black & Wheat fruit ale- raspberry nose-sweet, finish is very harsh, dirty; thin middle. 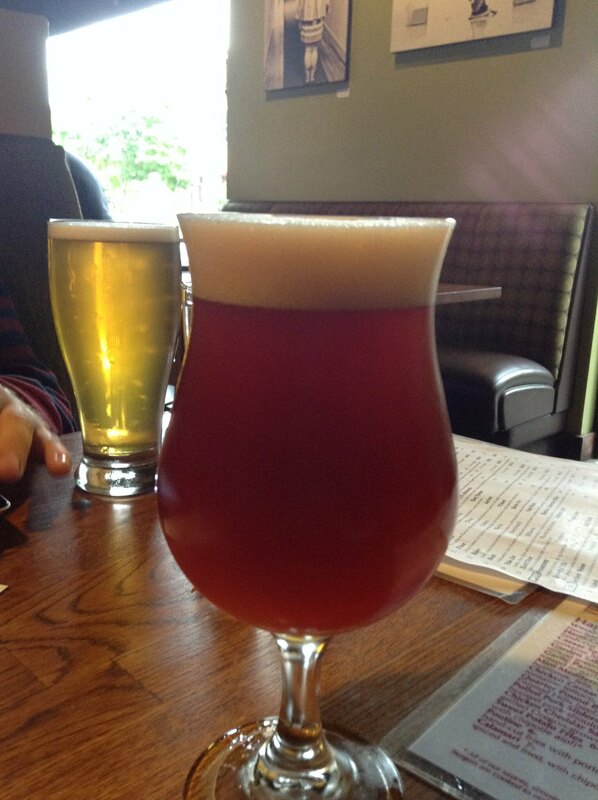 Beer Valley: Heavy Sugars Honey Ale- (pic) Nose has a farmhouse/creamed corn taste. Hint of plum? But there isn’t much else. It needs more of something; as it is, it tastes ethereal. Color is a nice pink though. Crux: Off Leash NW Session- Nice fruity nose. The finish is a little strong on grapefruit. Still, very drinkable in heat. More malt would’ve made this beer super. Dogfishhead: Aged Strong Ale- I can’t decide on this one. It starts solid but I get a soapiness in the finish. It’s just harsh, young and not ready for prime time. Elysian: Perfesser Belgian blonde- nose has a funk, thought it was Belgian yeast but no; Brettanomyces yeast is doing that. It’s restrained though, as a sour but the finish is pushing me away, getting more funky as I sip it. Deschutes: Gluten Free NW Pale- Nice. Dry finish, dankish nose is not too strong, easy to drink. One of the better ales I had. 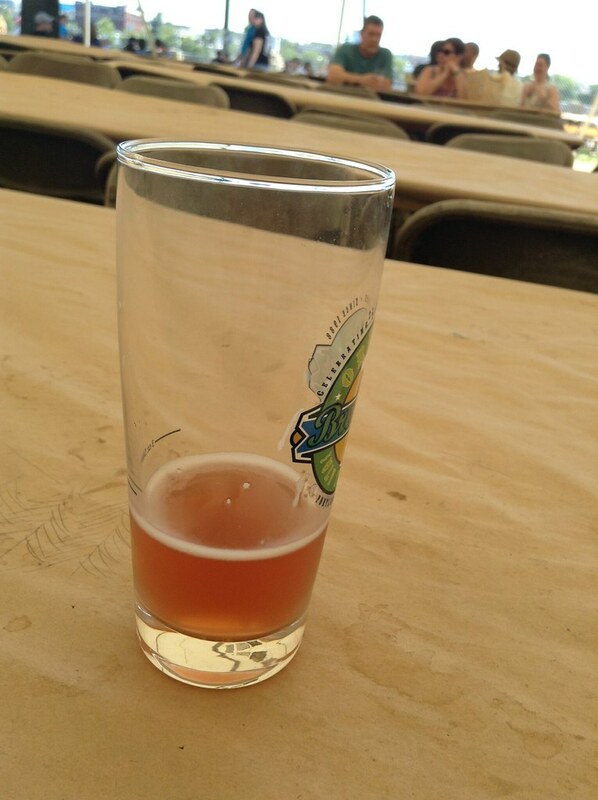 Logsdon Farmhouse: Straffe Drieling Belgian tripel-(pic) soft Bazooka Joe flavor with a hint of white wine dryness. Chamomile is notable, and somehow it all comes together to be pretty quaffable. Sierra Nevada: Coffee Milk Stout (collaboration with Ninkasi)- There is no milk here. It is a coffee stout, and barely achieves that on mouthfeel. Sigh. The Dudes: Grandma’s Pecan Brown english nut ale- Expectation of pecan not quite met but this is a nice brown ale. Roasted quality is nice, a little nutmeg but it’s restrained; all in all I like it. Sprecher: Abbey Triple Belgian tripel- Nose is nosy. Bah. But the flavors are soft, nothing to clove, fruity or harsh. Dry finish. I like this quite a bit, once I get past the nose. Nimbus: Old Monkeyshine Ale, strong ale- I got this in part because of the name, I’ll admit. The beer is roasty. It’s a little thin but it’s not a bad beer. Strong ales just need to have a bit more density/oiliness in the mouth, to me. Fitger: Hoppulujah IPA- Nice IPA. Grapefruit nose, nice bite on finish but there is just enough restraint to make it all work., since there isn’t a big malt presence. Dig it. I get a Pfriem Belgian Strong Dark; the malt does a nice job of keeping the belgian yeast flavors in check. Dig it. I’d have another if there weren’t so many things to try, tonight. But that’s the last note I get to make about beer for the evening because it’s so lively at Bailey’s. I have come to Bailey’s to play some Magic with Noah and shortly after we grab a table, we run into a couple that he knows from work. So we invite them to sit down and have a nice conversation: Noah and I just set aside our initial reason to be here so we can talk. Cities we’ve visited, short personal histories and beer recommendations are exchanged. They’re on vacation and are interested Magic. No, I don’t get it either. Suddenly, we are giving them an overview of how to play and it’s an experience that is both odd and awesome at the same time. The ladies are friends, currently living in Amsterdam and Shanghai respectively and had decided to meet in Portland to catch up and vacation together along the West Coast. Pretty cool! I mean, they ended up being oddly entertained by two geeky Americans and weren’t nearly adventurous enough in their beer choices in my opinion (they got the same thing over and over) but what the hell. It’s a strange life sometimes. Let’s keep it that way. This is why it is good to go out into the world: when the plan has to change and you just never know what the hell will happen, it’s usually at least interesting. I have been considering pushing more malt in my beer as of late and this would be the first to show that effort. It’s clearly a sweeter ale: maybe you could call it an amber-the C120 malt gave it enough color, that’s for sure- but I think it might have a life of its own. The honey malt has something to do with it, I think but there’s also just a restrained hop presence and a nice finish to this beer. The nose isn’t too potent with a hint of grass, I think but nothing to indicate a strong hop presence. 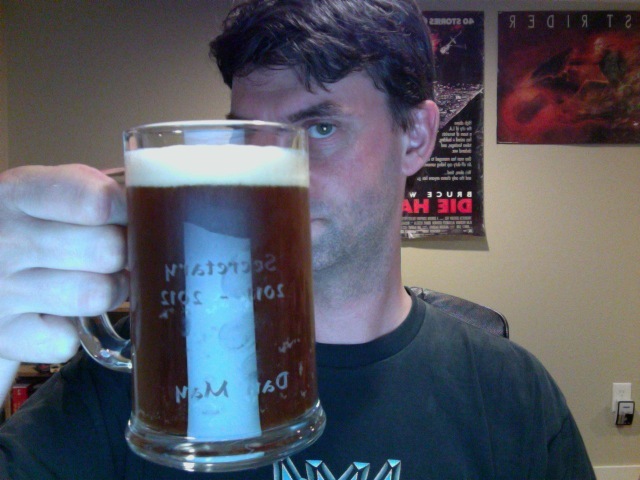 The beer itself isn’t too caramel focused and it finishes pretty cleanly, so I think I’ll have another. 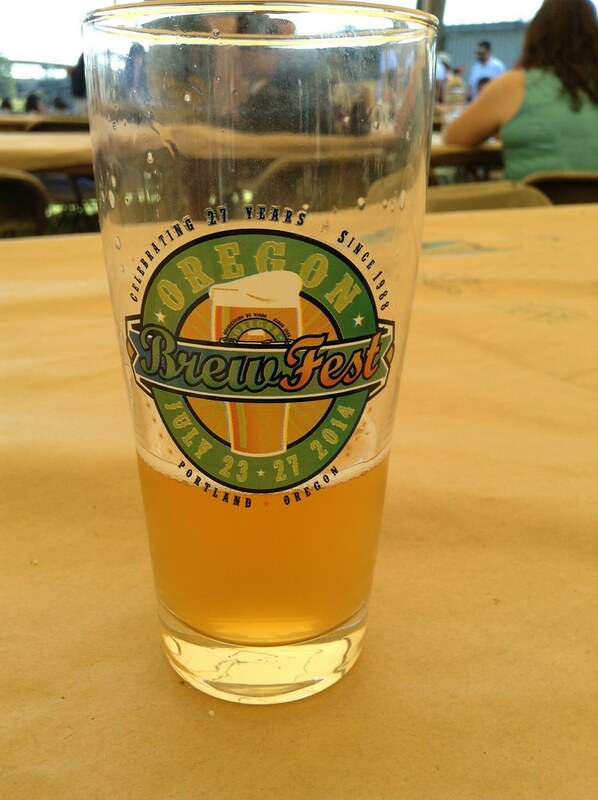 There are 88 beers available at the Oregon Brewers Fest this year. Damn, that’s a lot. More than one man can safely get through and keep a job, and as always I will have to pick and choose but I really hate doing that beforehand. Until my boots are on the ground I don’t have the slightest idea what will be available. Still, that doesn’t mean I can’t look forward at all: Ex Novo is a new brewery in town and I haven’t had their stuff at all, Crux has been consistently good since I was introduced to them last year, The Dudes’ and Sprecher are new to me and offering at least interesting styles of beer that I don’t see often at the OBF. Worst case, there are always the reliables: Widmer, Pelican, Deschutes, Elysian; year after year they produce tasty, drinkable beer and usually they want to liven things up at the OBF. Sure, they’ll be popular but maybe I can find a time when the lines are juuuust short enough that my patience isn’t tested. On top of everything else, it rained in Portland recently, so our heat wave has been broken, even if temporarily. That should make the event far more comfortable. It’s been a long weekend, ladies and gents. 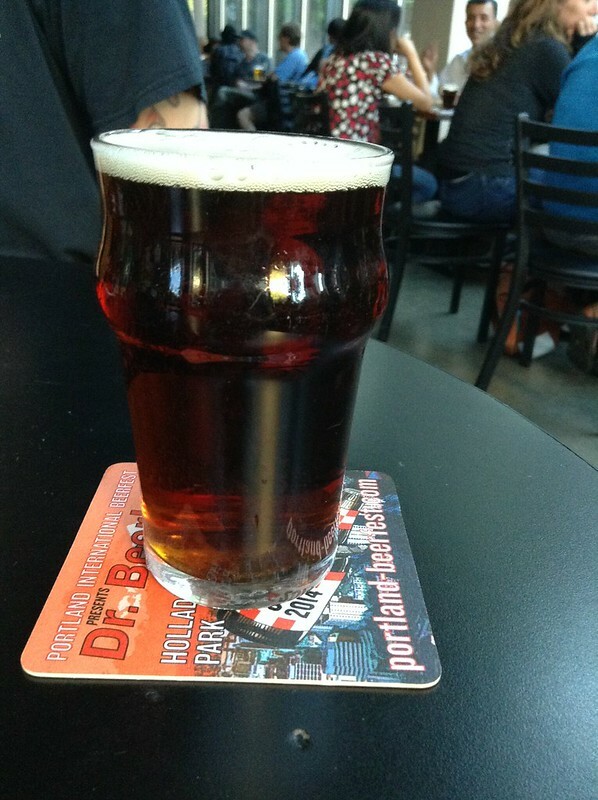 I’m gently sunburnt and far more bearded than I’m generally comfortable with, so I’m constantly rubbing my throat as I type at the Hawthorne Hop House to drink a Dopple Dinkle Bock from Deschutes. The beer arrives. Banana. So MUCH banana. Who said this was a good idea? I supposed there’s some flaming banana quality there, meaning I can taste dark fruit flavors in here but the description suggests a malt profile from Germany with PNW hops and there isn’t a trace of that in there. It’s so off, I ask the waiter to check the beer. It seems like a mispour; so many Belgian influences; fruit, a bit of fig, sweetness, etc and it just doesn’t seem right! But apparently it’s the right beer. Now, it isn’t an undrinkable beer. Not at all. But the gap between what I ordered and what I got isn’t an easy one to jump. This beer isn’t what it should be, so what is it? Well, it bears more resemblance to a Belgian dubbel, both in flavor and strength and I just don’t know what to do now. I can’t recommend this beer, because it doesn’t deliver on what it says it is. 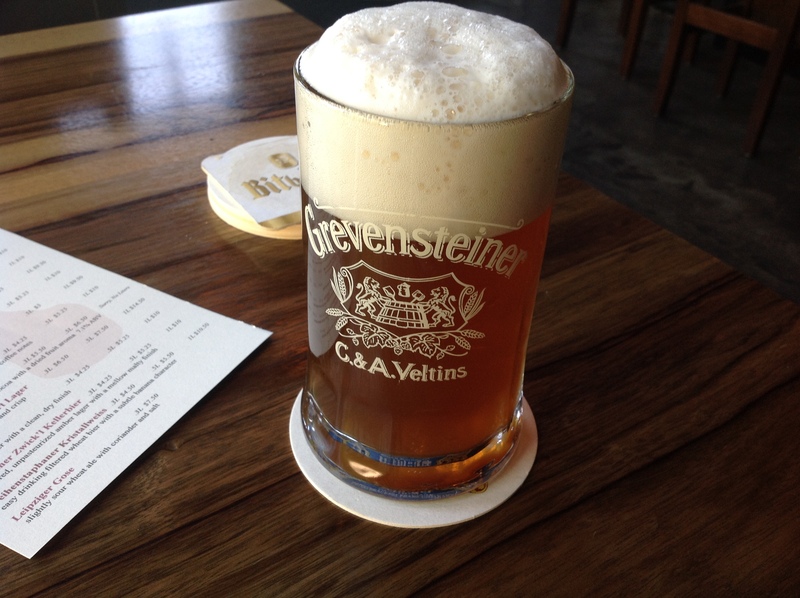 On the other hand, it’s not a bad beer, so…you should try it? On the upside, the waiter was extremely kind and more than willing to replace the beer if I wanted but I decided to delve further into this one and figure it out, rather than send it away. Interesting things are like that; let’s look into them further. Even if they are failures. 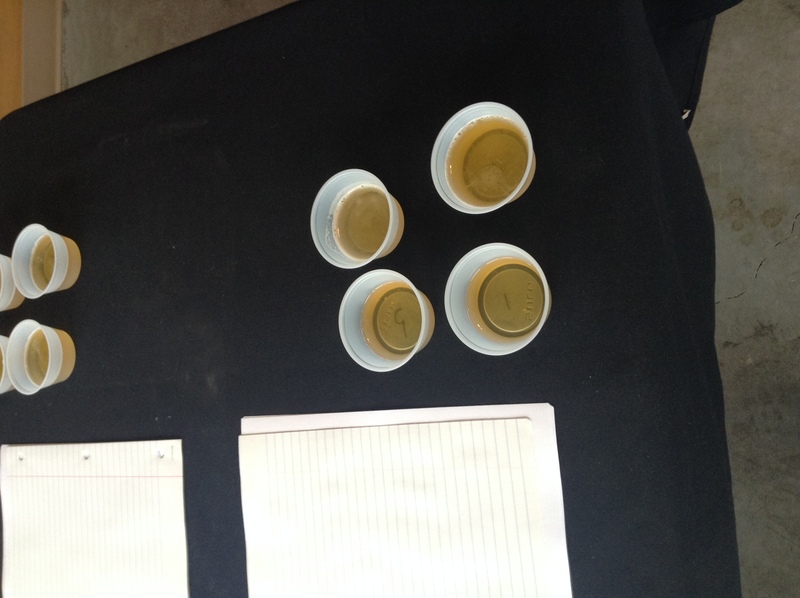 The OBC put on a workshop last Sunday to help brewers suss out off flavors in beer. So while those little cups look normal, they’ve all been doctored to produce papery, Acetaldehyde (green apple) or 22 other flavors. Twenty four flavors is a lot to try and pick out over the course of an afternoon. Certainly, some flavors were far easier for me to catch than others; DMS (creamed corn), Ethyl Acetate (esters, caused by bacterial infection), Spicy were all flavors I got pretty easily. But Metallic or Lactic or Acetaldehyde were all more challenging for me to glom onto. What was far more likely was that I would notice the mouthfeel, often as a sensation of dryness, usually on the sides of my tongue, that told me something wasn’t right: Mercaptan (a skunky note) or Isovaleric (cheesy, usually from old hops) wouldn’t present as negatively, except when it came to how it felt. This was a little weird and I think I’ll need some more practice with detecting flaws but this was a very cool way to learn, and thanks to the OBC for setting that up. Also, I’ll be out of town starting tomorrow, so no post for Friday! I w ant a Grevensteiner. It’s an unfiltered lager and I don’t know anything about that! How does that impact the beer? I need to know. At the Stammtisch, because it’s hot as hell in Portland and a place that tilts towards serving German lagers seems like a Pretty Good Idea. It’s pleasantly cool in here and very busy, although on a hot day like this? How could it not be. Wouldn’t you rather go down to any bar instead of be at home, in heat like this? On top of all that, I brewed today, which means my home is humid from the wort boil I did, in addition to the heat so let’s get out of dodge! It’s been a lame 24 hours. Mot awful but definitely not good. Under the circumstances though, what else is there to do but continue to do the work? Go out, get beer, write. If the work is available to me, doing it may be the only way to get out of the headspace I am in. The nice thing about German is that words pretty much pronounce as they appear on the page. Even if I’m doing it wrong, I’m still kind of doing it right. Unless I’m in Germany, in which case things are very different. The lager comes in a mug. I like that it has a handle to keep people from touching the cold glass. A hint of breadiness from the thick head, but nothing very intense. As I raise it to my lips, the scent gets a little funky, more yeasty instead of bread. But it is sweet and tasty. The finish is very clean, with just an elbow nudge of hops, likely Saaz but I’m not enough of an expert to say. What I do like is the body of this beer. My tongue can roll it around my mouth just a little, instead of swishing through it like I might with a lighter beer. Nothing heavy about it, not at all; better to say that this beer actually has density, where a straight up lager might not. I’m not sure how comfortable this table is, though. Everything is flat and angular in this place, except for the curved metal designs in the light fixtures and chandeliers. I am not sure how human that is, although perhaps it’s traditional? Plus, I feel like I’m sitting an awkward distance from the table. Maybe it’s an accommodation for the larger bellied amongst us? Feels strange, that’s for certain. Perhaps I should’ve chosen to sit at the bar, except the stools seem as if they are quite high. Like slouching might be a good way to relax at the bar. Maybe it is. I should ride the rail again soon. You see things at the front lines of the bar differently than you do at a table. Nature of the beast, perspective is. Let’s get some.